Who knew the term ‘robot’ came from the Czech ‘robota’, meaning ‘forced labour’? Not me. I only discovered this recently when I found this second-hand copy of Karel Čapek’s play R.U.R. (Rossum’s Universal Robots), which premiered 90 years ago, in 1921, and for which Čapek apparently coined the term. This tale of a robots’ revolt against their human masters is somewhat outdated, but still quite fun to read. This Penguin Classics edition features a translation by Claudia Novack and an introduction by Czech novelist Ivan Klíma. The cover photograph, copyrighted to Bob Elsdale / Getty Images, is disappointing: it looks as if a computer chip and circuit board had been painted on the model’s skin and as if the batteries had just been glued to the back of his head. 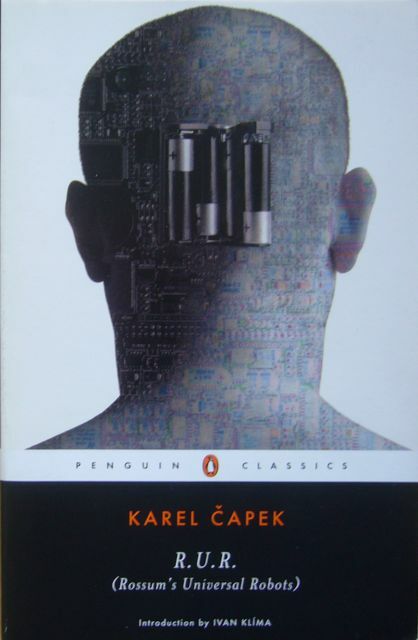 This entry was posted in Karel Čapek and tagged Karel Čapek, R.U.R., Robots. Bookmark the permalink.